Let DF-Mont-Mess be the category whose objects are DeepFrozen messages and whose arrows are DeepFrozen Monte objects. For our diagrams, we will follow the convention that arrows are arrows and objects are encircled. Since DF-Mont-Mess is a category, it must have an identity arrow for all messages. Let DF-Mont be the category whose objects are DeepFrozen values, not just messages, and whose arrows are DeepFrozen objects, as well as several primitives. The most important primitive is likely the ability to perform a call. This is like the Monte expression 1 + 1, or (1).add(1). It is also like the Monte expression 2. In DF-Mont, Monte execution is represented by diagrams which commute, and the direction of computation is indicated by the direction of arrows. We can formalize the statement that every object in DF-Mont is DeepFrozen by showing that there is a unique arrow (up to isomorphism) ! from DeepFrozen to any other object obj in the category. This diagram commutes. The up-to-isomorphism limitation comes from null in coerce/2; we may replace it in this diagram with any other object. Lists act as our products. 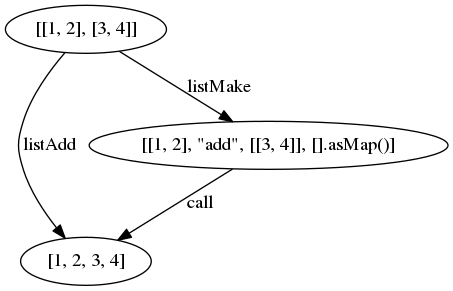 We can either use calls to do work on lists, or we can use categorical logic. 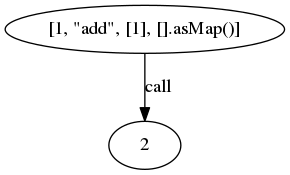 The arrow [[1, 2], [3, 4]] → [[1, 2], "add", [[3, 4]], .asMap()] is a member of a family of list-building arrows.